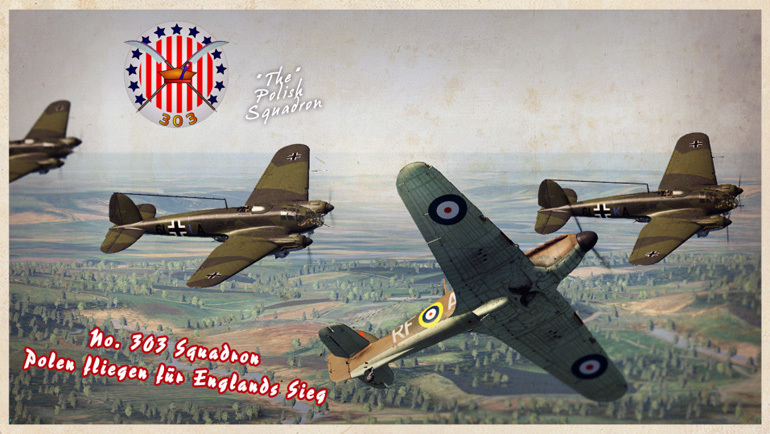 We recently had a highly immersive time playing through a Cliffs of Dover campaign which was part of the Desastersoft 'Fighter Aces: Galland' release, but which we had neglected. One of the great features of this campaign, in contrast to others, is that the missions feature large formations of both enemy and RAF aircraft. So yes, that means that even with the TF mod, you do need a PC with good specs to run the missions comfortably, but if you have that covered there is some innovative and challenging gameplay to be had. As you go into battle, you will often fly alongside 35 other RAF fighters in a wing, or 3 squadrons. One squadron will be flying top cover for you, and another will be 'on standby' ready for you to call it into the action. You do this via the radio, and the squadron on standby will immediately scramble from their airfield and fly to the position where you issued the call for help! This requires some thought, as they cannot be redirected when in flight, but I found it works very well if I am engaged in a big swirling furball with a mass of enemy fighters. These tend not to move very far and you feel a huge sense of relief to see a squadron of fresh pilots and machines barrel in to take on the enemy which often outnumbers you. It doesn't work so well if you are tyring to use the reinforcements to intercept enemy bombers, because unless they stay on a straight and predictable course, the point at which you issue the call for help, is rarely where the target actually is by the time your reinforcements get there. Nonetheless, an engaging and challenging campaign and great to get an insight into the missions flown by this band of very brave brothers.